train that body | Use it or lose it! 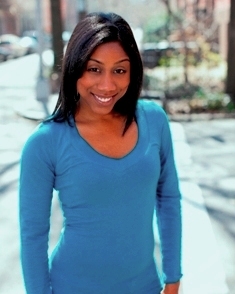 My name is Jowanda Durham and I am an actress, filmmaker, and personal trainer. I have been lifting weights and training my friends for over 15 years. One day in 2012, I decided to get paid for it! I started training clients at a local gym in Brooklyn where I earned the reputation as a top trainer. I train privately in gyms, homes, studios, corporate facilities, and parks. I am passionate about fitness. I focus on helping people build lean muscle mass and educating women on the importance of strength training. My philosphy about fitness is simple. “If you are able to move, then you must train your body.” I believe that the body will do what it is told to do over a period of time. My training style is a mixture of functional and traditional exercises. I use athletic drills, dance, yoga, and pilates to keep my clients excited about their workout. I am certified through the American College of Sports and Medicine. My blog is designed to help you train hard…eat clean…and look great! Hi. First things first. God bless you cancer survivor! Do you have a hypo or hyperactive thyroid issue. A thyroid problem can affect how fast your body metabolizes its foo. I know that it’s very difficult to lose weight when you’re dealing with that problem. I suggest that you get a checkup and see a nutritionist. Thank God for doctors but weight loss is not their specialty. There are a few things you can do to speed up your metabolism. (1) eat 5 to 6 healthy meals and snacks per day and (2) strength training. I don’t know your current routine but cardio alone will not help you. I hope this helps and follow my workout series starting in mid July. It will help you add variety to your current routine. Bless your heart. I know what it is like to no longer have metabolism. Have you considered Standard Process? A 35 year old company devoted to healthy body function. I lost 45 pounds on it and find it completely safe (with your nutritionist or chiro advice.) Speak to the expert Jowanda and if she doesn’t know she knows someone who does. Wow very impressive! Happy to be on “the team”!! You are great to work with and I am confident I will look and feel better under your guidance . Jowanda is great! I have been working with her for abut 5 months in preparation for my wedding and I feel much better about my health and arms (always a sore spot for me). I have muscle definition and am eating better than ever. Plus she is fabulous to talk to! I plan to keep working with her and continue my fitness journey. Help is on the way. Check your inbox. Help is on the way. Check your inbox. Start now set monthly goals and transform your life for good- not just for the wedding!